Receding gums are a common problem. But they can create a whole multitude of bigger problems if left untreated, possibly leading to infection, tooth loss and even other health issues. So What Are Receding Gums? It's basically where the edges of the gum next to your tooth wears away. If you can see or feel a gap or a rough edge of the tooth at the gum line than you have gum recession. This is also where the phrase 'long in the tooth' comes from - receded gums make your teeth look longer, and historically were a sign of age. But we have better dental care these days! If you are experiencing gum problems it is of course best to seek the help of a dental professional. Yes, there are measures you can take at home to greatly improve your gum health, but sometimes some initial treatment from your dentist will be necessary, or greatly help your own efforts. Many people believe that aggressive tooth brushing will kill all of the plaque and make their mouth healthier. 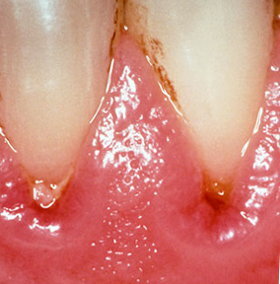 However, this is not the case, and instead is one of the most common causes of receding gums. Aggressive brushing can actually wear down your gums, making them more susceptible to germs and bacteria. Additionally, it wears away tooth enamel, which can then trap bacteria in the worn spots, creating tooth decay which can further erode the gum line. So be thorough when you clean your teeth, not firm. You don't want to avoid your gums when brushing either. But always use a soft bristled toothbrush (hard brushes are for dentures, NOT for your mouth!). And be extra gentle near the gum line - try gripping the brush with just your fingertips so you can't apply as much force. And whilst it may be tempting to use mouthwash (as it also reduces bad breath temporarily), this can actually hurt in the long term. Most mouthwash is made using alcohol, which has a drying effect on your mouth and stops saliva production. Which isn't a good thing as saliva is your bodies natural mouthwash and gum defender! Another cause of gum recession is tooth grinding. This pressure is not natural, and the extra force on your teeth can cause gum problems and disrupt the harmony of your entire mouth. You can treat this with an over-the-counter mouth guard or you can have one professionally made. If you grind your teeth during the day, consider relaxation or a massage to reduce the tension you carry in your body. Most dental professionals will begin the treatment for your gum recession with a deep cleaning. This will remove all of the plaque and tartar buildup below your gum line. Additionally, any rough edges below the gum line are smoothed out through a process called planing. Occasionally, a dentist will prescribe antibiotics to ensure that all remaining bacteria are killed. It is then up to you to keep your gums clean using the tips above. If this method is not effective at treating your gum recession, your dentist will likely perform a surgical procedure to help you. During a pocket depth reduction, the dentist pulls back the gum pocket where the recession is occurring and gently removes all harmful bacteria before securing the tissue back into place. A similar procedure involves the dentist using a membrane like material to help secure the skin back into place. The problem of receding gums should not be taken lightly. If you have noticed an issue with your gums, the first thing you need to do is make an appointment with your dentist. After a thorough cleaning, the two of you can develop a plan to best treat your gums. You do not want to wait to have treatment begun. The health of your mouth is too important to delay having proper treatment on. But prevention is of course the best approach - so make sure you also make the adjustments to the way you clean your mouth in order to keep the rest of your gums healthy too.